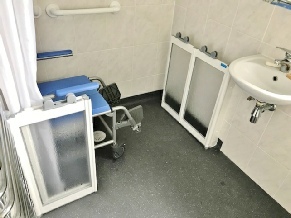 The bathroom can be an unsafe place at the best of times, but when struggling with mobility problems it can make bathing challenging and worrying. To help overcome this, there are many aids available which can be simply and cost effectively added to your existing bathroom or incorporated into a new shower room. Many solutions are available to suit your individual needs which can help to make bathing safer and enjoyable. You may also qualify for a reduced rate of VAT or VAT exemption on the supply and fit of mobility aids. Please see our VAT exemption page for further details. Grab rails are a simple addition which can bring great benefit when extra support is required. If you are using the wall, door or radiator for support a grab rail will be much safer. They can help with sitting and rising, or to assist with balance. Drop down rails can be fitted next to the toilet or basin and folded back when not in use. Grab rails are a great value aid which can make your bathroom safer and easier to negotiate. The addition of a shower seat can make the process of bathing a more relaxed, enjoyable experience. Providing comfort and support it’s a perfect way to maintain independence. Several styles are available to suit your individual needs, and with many models being wall mounted, they can be folded back when not in use, making the shower area suitable for multi-generational living. The increased height of a raised height toilet can improve comfort for the elderly or users with reduced mobility. Reducing the distance required to sit and stand, they can make a big difference where mobility or muscle weakness is a problem. Options are available with standard push button flush operation or with a paddle flush which requires minimal pressure for those with reduced dexterity. A raised height toilet can also negate the need for a raised toilet seat, perfect for homes with multiple occupancy. Toilet plinths are also available which can be fitted beneath the toilet pan to raise it’s height to a more comfortable level. A great option for those wishing to retain their existing toilet. Turning traditional taps on and off can be a challenge for those with reduced grip or strength in their hands. Lever taps require only the minimal amount of effort to operate and make it easier to regulate flow and temperature. Taps are available in twin or single design, making them a simple replacement for your existing bath, basin or kitchen taps. Thermostatic models are also available which control the water temperature below a pre-set level to prevent the risk of scalding. 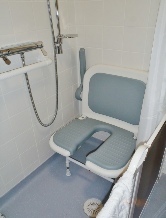 For those requiring assisted bathing, fixed half-height carer screens are of a particular benefit. They provide a showering space whereby the carer can remain dry whilst giving assistance and can be incorporated into your level access shower design. 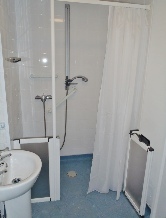 With many options being available, some screens are able to be completely folded back whilst not in use, allowing the full shower space to be used by other occupants. Stable door options are also available to enable the screens to be used as half-height or full height shower doors, perfect for multi-generational living.